Hotel Indigo and The Residences & Suites at 151 | 12 luxury condominiums perched high atop the Hotel Indigo in Downtown Asheville. The hotel industry has a wide array of great people that you choose to work with and serve as valued customers. The below correspondence is a valued customer that was impressed by the hotel offerings and overall capacity. This is one of many examples of why we love to serve others…..
“I checked out our brand new downtown Asheville Hotel Indigo yesterday, got the manager’s tour, and was dazzled. I recommend a single king and will request one high up with a view. The rooms are gorgeous, wonderful, beautiful, well designed and beautifully lit. It really is a lovely and commodious place, nicest hotel in town by far, and perhaps nicest I’ve ever seen (tho’ I’ve seen less of the hotel world than you have). 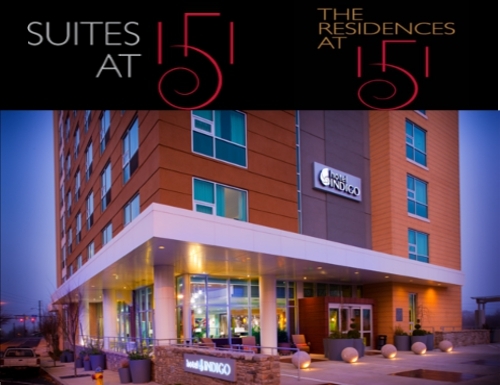 Indigo offers great location, 2 mi. from campus (and I will be your chauffeur — chaufferesse?). It offers close walkability if you want to get out a little on your own and see a bit of funky, artistic, youthful, energized downtown, bookstores and cafes just a block away. Inside, the Indigo offers gorgeous furnishings, captivating art, huge picture windows, WiFi in every room, flatscreen TVs, huge bathrooms with finest fixtures and some sort of exotic European full body shower I didn’t want to ask too much about, seemed a bit Euro and I was embarrassed not to know! Even the hallways and decor en route to rooms were bright, artistic, wonderful.